RSMSSB NTT Teacher Govt Job Exam Notice Check Here. RSMSSB Notification is out. RSMSSB is recruiting for 1310 NTT Teacher Govt Job 2019 Posts. 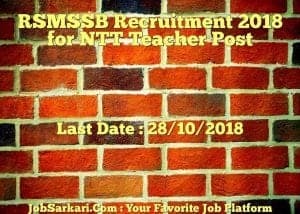 You can check RSMSSB - Rajasthan Subordinate and Ministerial Service Selection Board last date, download RSMSSB notification, visit RSMSSB official website and check other RSMSSB Vacancy details.Complete Vacancy and recruitment Details about 1310 NTT Teacher Govt Job 2019 vacancies in RSMSSB are provided below by JobSarkari.Com only for you. Last Date for Payment of Application Fee 28/10/2018. General / OBC / Other State Rs.450/-. SC / ST / Candidate Having Family Income Below Rs.2.5 Lac P.A. Rs.250/-. Mode of Payment Application Fee Can be Submitted through Online Mode or E-Mitra Kiosk. NTT Teacher Non TSP 501 218 158 119 996. NTT Teacher TSP Area 115 00 11 184 310. NTT Teacher for Baanra District 00 00 00 04 04. Total No of Post 616 218 169 307 1310. Candidate Must Have Passed Class 12th and NTT Certificate Course With Knowledge of Devnagiri Language and Rajasthan Culture. Candidate Will Have to Produce Income Certificate to Avail the Exemption in Fee. Q. 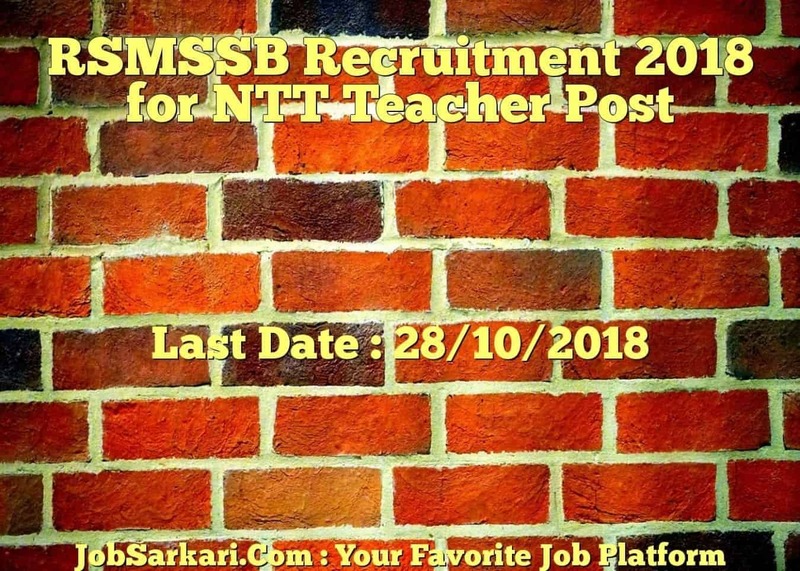 What is the Last Date For RSMSSB NTT Teacher Govt Job 2019 Vacancy ? A. Last Date for RSMSSB NTT Teacher Govt Job 2019 Posts is 28/10/2018. Q. What is the Form Type of RSMSSB NTT Teacher Govt Job 2019 Recruitment ? A. The Form Type for RSMSSB NTT Teacher Govt Job 2019 Posts is Online. Q. How many vacancies are available in Rajasthan Subordinate and Ministerial Service Selection Board NTT Teacher Govt Job 2019 Posts ? A. There are about 1000 Vacancies in Rajasthan Subordinate and Ministerial Service Selection Board NTT Teacher Govt Job 2019 Posts. Q. What is the Full Form of RSMSSB ? A. Full Form of RSMSSB is Rajasthan Subordinate and Ministerial Service Selection Board . Aap is link se sabhi 12th pass jobs k liye apply kar sakte hai. what is syllabus of RSMSSB NTT Teacher Post Vacancy ?